Big 6.5 inch scissors. 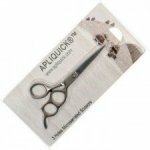 These unique scissors have been ergonomically designed to prevent strain on fingers and joints. All five fingers lie in a natural position as you cut. 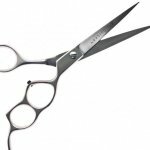 The microserrated edge grips the fabric, holds it in place, and cuts without fraying. For cutting gentle curves and straight lines. I use these when cutting batting or across large pieces of fabric.